Planning for your child’s birthday? Celebrate with The Crafty Kids! The Crafty Kids make the best day of the year even better! We host birthday parties at our location or yours! Mini-artists will discover and explore their natural talents while learning art techniques and completing our uniquely designed craft projects with their own hands! The Crafty Kids custom designs craft projects for ANY party theme. Tell us your favorite theme and we will custom-design craft projects geared to bringing the most fabulous and memorable birthday experience to your child and guests! From hand-picked materials to project instructions personalized with your child’s name, from our friendly attentive staff to the theme color of your choice, our party packages are put together with care just for your guest of honor! Don’t have time to plan a party? Our parties are so easy- we can even decide the entire event by email! Come with your crafting appetite to our clean and bright studio or we can bring the fun straight to your place! Our friendly, well-trained, and attentive staff will keep your party guests entertained! Craft project are custom-designed personalized for your child, event theme, and party colors. The Crafty Kids comes to your location. Craft project is your party entertainment. All materials and tools for your craft project included. Two staff members provided for the first 12 guests. We clean up after the craft. Up to 30 guests. Additional staff member required for every 5 additional guests. For each add $40. Any location below Canal Street in Manhattan. Other locations available for an additional fee. Discounted party favor add-on option at only $10 per custom-designed party favor. Craft project custom-designed for your event theme and party colors. 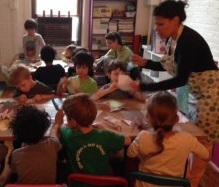 Two-hour party at our art studio in Lower Manhattan. Craft project is your main party entertainment. Other activities in the party theme keep guests entertained throughout the party. Includes recycled napkins and compostable plates, cups, and cutlery. Our friendly staff takes care of all the clean up. Accommodates 12 children. For each additional guest please add $20. Add-ons: favors, decorations, photography, balloon art, face painting, invitations, or extra time. All materials for your craft project included. Color instructions personalized with your child’s name. 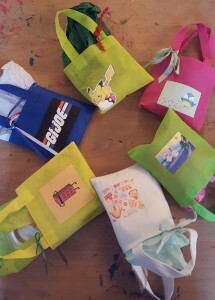 Each craft project packaged in a colorful reusable mini-totebag. Festive mini-totebag decorated with tissue paper, iron-on, and ribbon in your event theme and party colors. * 50% of package cost must be prepaid. Remainder is due upon delivery in cash or credit card.